We are supposed to postpone this for next month, but then we thought some visitors may be waiting for an updated list of properties for sale or assume from other site visitors. That’s why we have to put this thing up for everyone to see. For the month of August, we have decided to feature the following two properties from Cavite (house and lot) and from Quezon City (condo unit). If you are looking to buy a property in any of these places, please check this out. 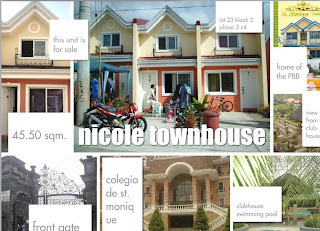 Note: You too call sell any property that can be financed by Pag-IBIG Housing Loan. Whether that property is yours or that of your friend, you can post it here FREE of charge. For details, please visit the Pag-IBIG Marketplace Section of this website. Complete amenities, including mini-clubhouse with swimming pool, basketball courts in each phase and park. Perimeter fence, guardhouse well-maintained, well-loved! occupied by the owner. Clean title, taxes paid until 2014! Since I am residing in the house, it has been well-maintained. I really love the house but I need to transfer to Bacoor because my parents live there. El Pueblo Condormitel Quezon City or EPQC is not just a home but an upliftment in the standards of living, measured in terms of clean, economical unit structures, well-maintained facilities and landscaped open spaces. The El Pueblo Condormitel concept is a fusion of a condo, a dormitory and a hotel. El Pueblo One Quezon City is located inside Kingspoint Subdivision near Mindanao Avenue. All El Pueblo Condormitel Q.C units are fully furnished with appliances. El Pueblo’s concept was based on three major philosophies: Respect for nature, Lifestyle Integration and Understanding of Human needs, which when put together will result in Quality of Life. El Pueblo Condormitel Quezon City is not just a home, but an environmentally sound upliftment in the standards of living of the urban work force. Here’s a list of Pag-IBIG Properties for sale by individual sellers from the various places in the Philippines. If you are interested with any of the properties here, please contact the sellers directly. Their respective contact information are also indicated at the proper places. Details of the properties will be shown below. If you have a property that you want to sell, too, don’t hesitate to submit it here by using the Form at the Pag-IBIG Marketplace Page. See to that it can be financed using Pag-IBIG Housing Loan. If you are interested with the property, please direct your inquiries at the name contact details of the owner indicated. Other properties that will be submitted to us within the month of July 2011 will also be listed on this page. If you have a property for sale, please feel free to submit it to us for everybody else to see. Use the form provided at the Pag-IBIG Marketplace page. 13.5sqm, Ready for occupancy, fully furnish condominium, with appliances. Walking distance from PUP, in front of Filinvest Condominium. Why should you buy this property? In demand for renting out to students studying at PUP and other nearby schools such as CCP, UERM, university belt. They can cook and do their laundry inside. Nice environment with security and cooperative community. Why am I selling this property? I have a growing family, I just gave birth and we will move in to my husband’s house near my office. Ms Kristine Tomes at this line: 09232284439. Php284,800.00 (negotiable), assume balance thru Pagibig, monthly amortization 5,700.00. 45.50sqm, Ready for occupancy, 2-bedroom upstairs, with dirty kitchen, provision for garage. Our unit is a 5-minute walk from the main entrance gate. How to get there: From main entrance gate, turn left on the 1st road. Block 31 Lot 31 is on the 3rd block, 8th duplex unit. Why Is This Property For Sale? We decided to stay here in my hometown at San Pablo City, Laguna. Our unit is in good shape, and never been occupied. San Isidro Heights is a FLOOD FREE area. Again, please take note that if you are interested with any of these properties, contact the respective sellers directly. Thinking of selling your property? Post it here for free.